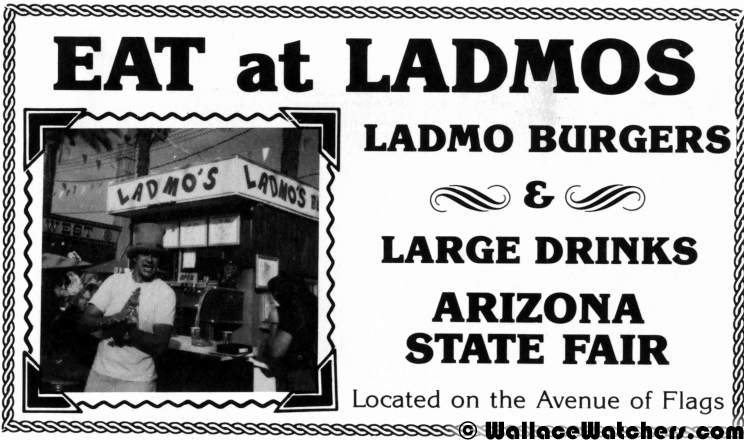 Apart from the daily show, Wallace and Ladmo and the gang also made tens of thousands of personal appearances all over Arizona. From the Arizona State Fair to school carnivals to shopping mall openings, they could be found nearly every weekend playing at some public event. For the first few years of the show, Wallace was a solo act. 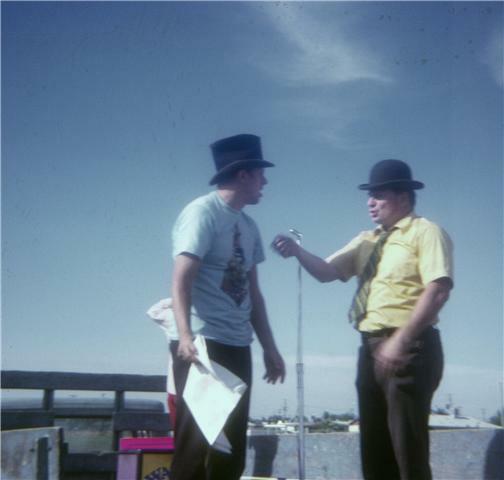 I found some Wallace and Ladmo photos from when I was teaching in the 70s. They came to a carnival that we put on at the school. I remember they asked me on the phone if we had a stage, and I said, "Well, we have an old, flat bed truck!" And as you will see, that is what we used!! These two photos (above) were taken in April 1973 at M.C. Cash School Spring Carnival. Near Manzinita Speedway, 35th Ave and Broadway Rd. 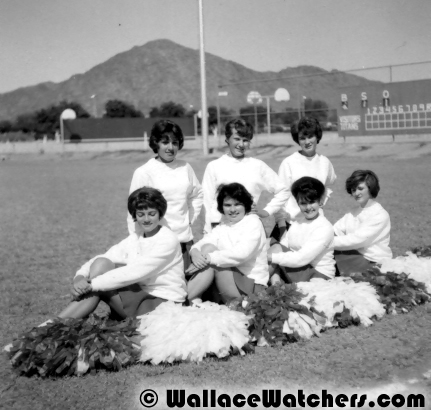 I remember when I was probably in the second grade, Wallace was over at Goldwater’s [department store] in Park Central. He was drawing cartoon sketches. All the kid fans at that point in time went over to Goldwater’s to see him draw these cartoon sketches. He’d just rip them off of this, it was probably a two foot by two foot sheet of paper. He’d thrown them down and the kids would grab them and take off with whatever it was he was drawing. He’d draw character sketches of people. He’d draw Daffy Duck. Other cartoons he created himself. 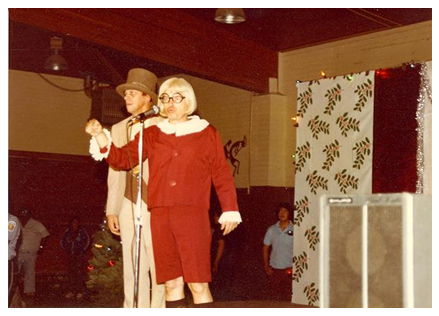 Indian Community Christmas Program (1983). 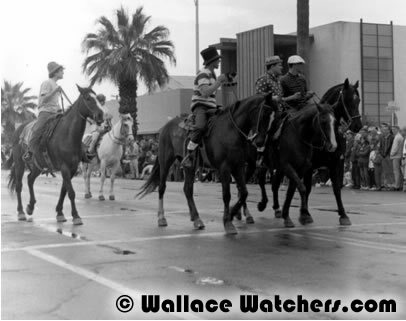 in a parade in downtown Phoenix. There were several movie theatres that offered Saturday morning double-feature (remember those?) kid’s movies. 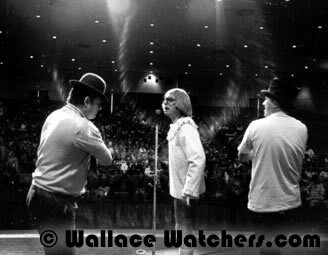 Wallace and the Gang were a staple at the Fox Chris-Town Theatres on 19th Avenue and Camelback and the Fox Theatre in downtown Phoenix. Gerald, as usual, was the target of the kid’s wrath. Even at Chris-Town when the kids attacked him, Gerald was hiding behind this huge curtain that covered the screen. And he ran behind that curtain and the kids were pounding on that curtain and Gerald was running. The ushers were trying to get these kids back. Hundreds of kids. And again Wallace and I, we were standing on the stage laughing. ‘Go get him. Go get him. He deserves it.’ Ever since then we always tried to have some kind of security guards just standing on the corners of the stage. We were laughing, but it was serious. He could have really gotten hurt. As I got older, my parents would leave me off at the old Fox Chris Town Theater . . . to see the stage show. It was so neat to be in that gigantic auditorium with all those kids screaming at Gerald. Dad would give me a dollar. Fifty cents would get me in, fifty cents would be for popcorn, and they would give us free Double-Bubble [chewing gum] on the way out. Touted as Arizona’s answer to Disneyland, Legend City opened on June 30th, 1963. The western-themed fun park featured rides, live acts and stage shows of all kinds. The Lagoon Stage was the site of hundred of Wallace and Ladmo stage shows. Hub Kapp and Mike Condello performed many a concert there. After changing ownership a few times in the 70s, Legend City finally closed in 1983. The park was demolished and today it is the site of the Salt River Project (SRP) headquarters building near the intersection of Galvin Parkway and Van Buren. I did attend shows at the [Arizona] State Fair. 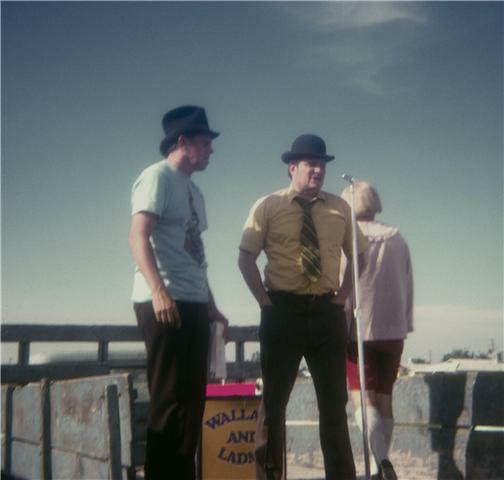 I remember that my brother and I had Wallace and Ladmo t-shirts and we booed Gerald so loudly that we were hoarse the next day. Even my mom and dad booed Gerald, which was really funny. When Gerald’s Monster came out on the stage, I started crying because I was really frightened. In 1964, the gang formed a sports team that was sponsored by Red Ball Jets tennis shoes. They purchased the uniforms, jackets and the shoes. 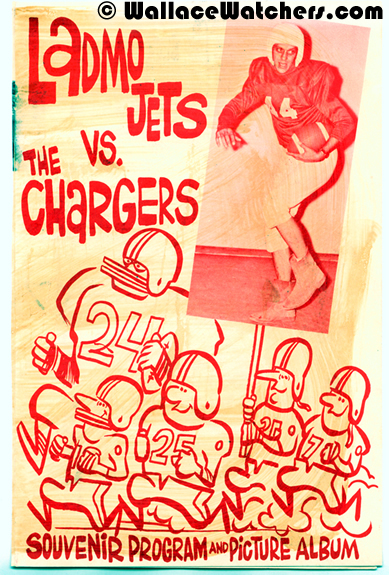 The Ladmo Jets were made up of Wallace, Ladmo, Pat, the LaChords (Dan Moss, Al Douglas and Gene Blue), Mike Condello, Brian Donohue, Tony Evans (of KRIZ radio). The Jets would play football, softball, basketball and even boxing. 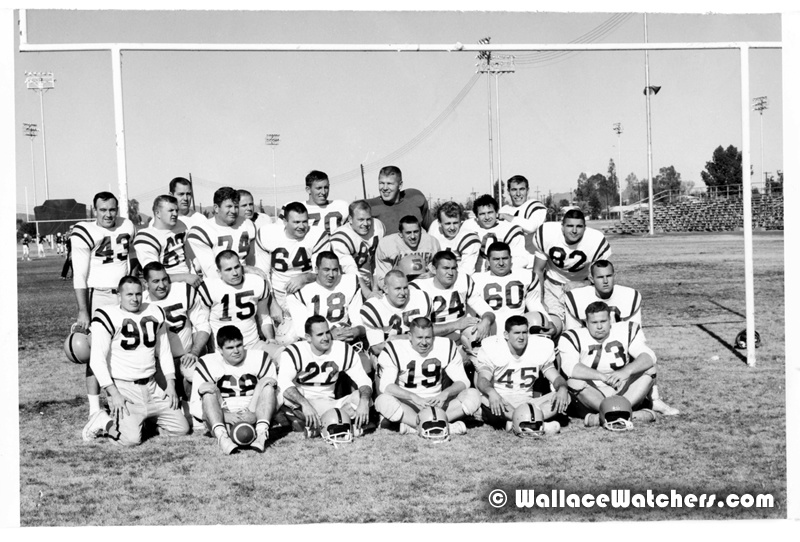 The Jets would travel all over Arizona, playing other sports teams comprised of local coaches, DJs from radio stations or even varsity teams from local high schools. The games were charity events. 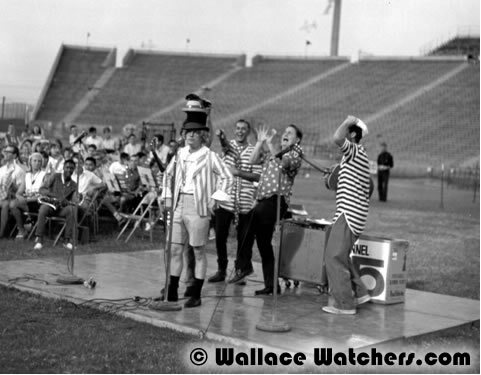 A regular Wallace and Ladmo stage show would precede the game. Dollar tickets were sold for the game itself. Ladmo remembers . . .
We had a tremendous schedule. We played just about every week. Sometimes twice a week if the schedule allowed it. We would go at 7 p.m. and play at Chandler and the next day we’d be 7 p.m. at Buckeye. We traveled the state that way. We always recommended to get grade schools and high school involved. We’d go like to Chandler or Eloy or wherever we went to. We’d say ‘Make sure you get your elementary grades, get a few teachers’ and they did. The whole community turned out. Wall had it figured at one time [that we raised] over a million dollars and I believed it. Whatever they hired us for, whatever charity, was fine with us. We would always promote it that way. LADMO: If I’m elected, I will visit every school and give away Ladmo Bags. GERALD: If I’m elected, I will visit every school and recite poetry. LADMO: Vote for me, and I’ll have your teacher serve ice cream and cake in the classroom. GERALD: Vote for me, and I’ll sing opera in the classroom. LADMO: A vote for Ladmo for governor is a vote for cartoons in school assembly. GERALD: A vote for Gerald for governor is a vote for my ballet in school assembly. Yes, I will come to your school and do the ballet for you. LADMO: If you support me, gang, I’ll have the school board put root beer in the drinking fountains. GERALD: I’ll have carrot juice. It’s good for you. And Gerald knows what’s best for you. LADMO: Elect me and I’ll fix it so you only have to go to school four days a week. No school on Fridays. A three-day weekend. GERALD: You need more time to study! I’ll make you go to school on Saturdays. That’ll make six days a week. LADMO: If I am elected, I’ll get you longer lunch hours. Two hours. And free hamburgers for everyone. GERALD: You’ll get a two-minute lunch period if I’m elected. And nothing but carrot juice. LADMO: Remember, when Ladmo wins, you only have to go to school three hours a day. And two hours of it will be lunch period. The other hour will be play period. And no homework! GERALD: If you know what’s good for you, you’ll vote for me. Then you’ll go to school twelve hours a day. From six in the morning till six at night. And no play period. And there will be six hours of homework every night. You will study, study, study. Gerald for governor. Today Arizona . . . tomorrow the world!! Vote for me or I’ll get my monster after you . 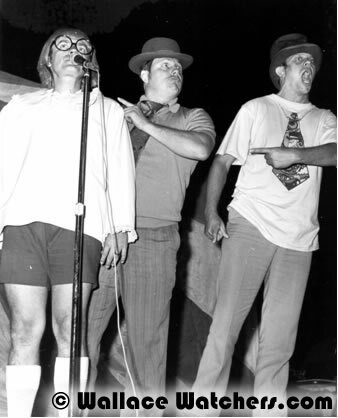 . .
One of the most unusual (and dangerous) public appearances by Wallace and the gang was a promotion staged by the now-defunct Phoenix rock n’ roll station KRIZ in 1967. ‘Save the Bridge’ was fairly typical of the kind of promotion that we used to do on KRIZ and I’ll tell you I wish I could tell you it was original because we were so creative. We had to do it differently from all the other radio stations. The reason we did it differently is we were so broke we couldn’t afford to give away cars and trips to Europe and things like that. 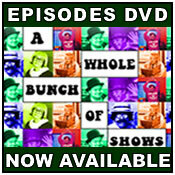 What we did was create a fun promotion and it captured the audiences’ imagination. The Bobbie Gentry record Ode to Billie Joe came out and, of course, it was a story record that I’m sure everyone remembers. When you listen to the story, you’re aware of the fact that some mysterious goings-on took place on the bridge, the Tallahatchie Bridge. We actually created a controversy, major expose involved with what it is that was going on and the minister that was involved. I forgot his name. 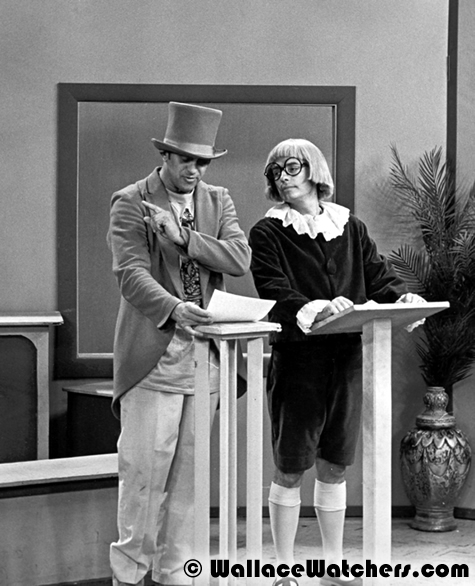 The Reverend ‘something.’ We got an actor to call the radio station and say ‘You’ve got to stop playing that vile and corrupt record.’ We had the characters as living people calling and created a major news controversy. Sandy Gibbons as the preacher, reverend, actually made a huge entrance through what I believe was something like thirteen thousand people at Encanto Park that came out of fun. You see, that’s the wonderful part about it was they knew it was a wonderful satire and it was a put-on of the demonstrations going on at the time for real. The serious demonstrations were kind of getting to be old. So we staged our own demonstration, not to make major social changes but to save a non-existent bridge. On KRIZ radio for two weeks leading up to this promotion, you see, the first week, I was on soliciting funds to destroy the bridge. Pat was the program director at that time. Going into Encanto Park . . . that was the craziest thing I’d ever done. The closest I’d ever come to getting killed, too. It turned into a mob by the college kids. They thought maybe fifteen hundred tops would show up. It turned out it was fifteen thousand screaming people. They were caught up in it. Their eyes were glazed over. Wall, Condello and I hid out there and said ‘God, there’s a lot of people.’ It filled the whole amphitheater. I said ‘Let’s do it!’ So I got up, Wallace was beating a big bass drum and like the Red Sea parting, letting us come through. I had a big placard saying ‘Destroy the Bridge’, black cape, black suit, the bow tie, the beaver hat. The ferocious face. When I went down to make by opening statement as the Reverend R.T. Taylor, when I tried to get away, they spotted me and picked me up and then they put me over their heads and passed me across this huge crowd out there. I’m saying ‘I’m Sandy Gibbons, I’m not R.T. Taylor.’ They threw me to the ground and guys started kicking me and this could really get bad. They beat me up pretty good. And I said ‘Just don’t throw me into the lagoon.’ So they said ‘Throw him into the lagoon.’ I wanted them to. I wanted to get rid of them. I was on the ground being pummeled. So these guys, they’re big guys, they picked me up and threw me in the lagoon. I had on a black cape and a black beaver hat. I didn’t have the hat on any more. I lost the hat and I lost a great hairpiece. Cost me about twelve hundred dollars. It was just torn to shreds. 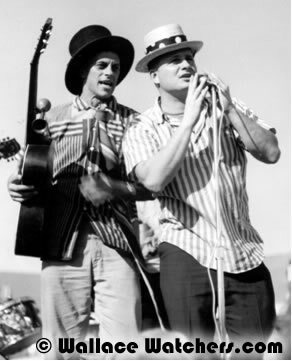 I remember seeing Sandy Gibbons as the preacher up on the Bandstand Stage in Encanto Park imploring people, I guess it was to tear down the bridge. Then there was a lot of commotion and dust and I didn’t see Sandy. And then, I was at the back of the crowd, and the next thing I know he was being hurdled along, carried overhead by a mob. I wanted to help him. There was really nothing I could do. Besides, I was laughing too hard. The next thing I saw was a crowd of easily 50, 60 guys threw him in the pond at Encanto Park and he was out in the middle and then they started lobbing grapefruits. Sandy tried to get out to the very middle because the grapefruits were coming fast. He was pleading, and I looked carefully, I mean he was really pleading. He was begging and I wanted to go out there and get him out but again, I started sliding down the tree I was leaning against, laughing too hard to save him.